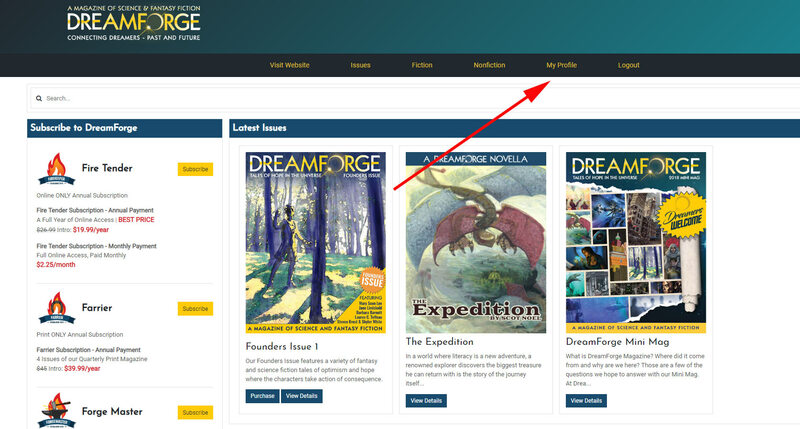 DreamForge Magazine uses a cloud-based portal to which you upload your stories for consideration. Login (if you have an account) or click Need an Account? (if you don’t). Visit My Profile in the menu and select Upload a Submission in the options on the left. Click New Submissions, fill out the next screen, upload your story file, and click Submit. If you are a DreamForge Subscriber or created a Free Registration earlier, just login using your email address and password when you visit our DreamForge Portal Login Screen. 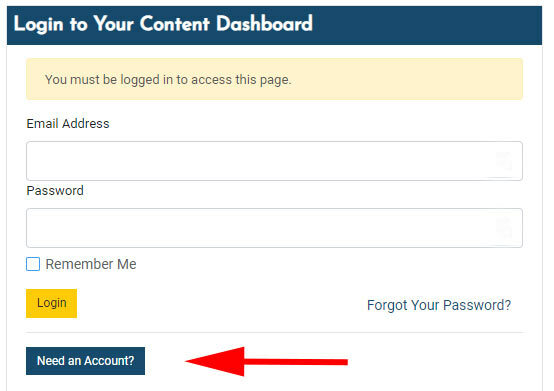 If you do not have an account, select Need an Account? and create one. FYI, you can click any image on this page to visit the Login Screen shown above. For your protection, DreamForge does not sell, trade or expose your email address to spamming. We may occasionally make you aware of special DreamForge news. This step is necessary only if you are new to DreamForge and DO NOT already have a login. Create your login and click submit. This is the screen you arrive at whenever you login with a Free Registration. Your Free Registration does give you access to some stories and articles not yet available to the public. Note that you have a My Profile option in the menu. Select My Profile to continue. 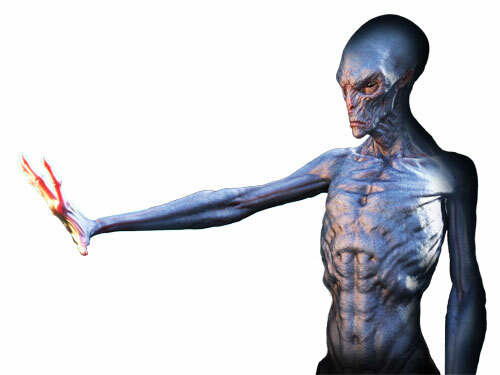 You can upload an Avatar or your Picture if you like. 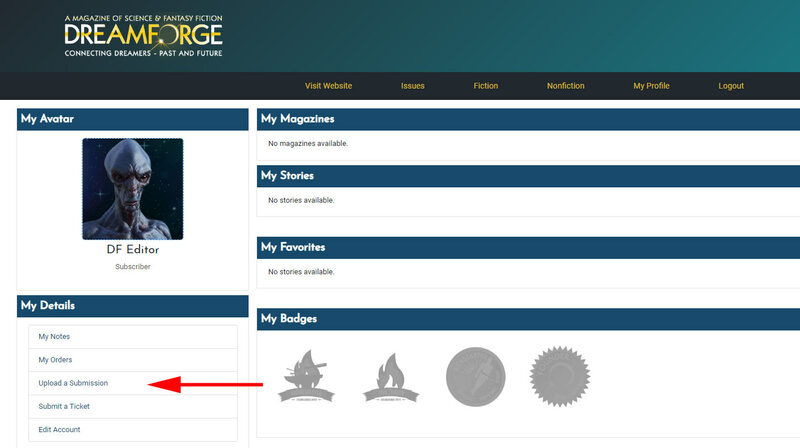 Magazine Purchases, Favorites Stories, Articles, and Earned Badges show up here. Note that you can Upload a Submission. This page looks a little repetitive, but, as we’ll see, it keeps track of all your story submissions. FIRST, review our Submission Guidelines, then go ahead and make a New Submission. Like the instructions say, please only submit one story at a time. If your submission is returned, you may immediately submit another. This is where you write (or copy & paste) your Cover Letter. Enter your Story Title and Select a Category and Type. Enter the Story’s Word Count (NO commas). Your story must be submitted in Word or RTF format. Section breaks, as needed, should be three ### symbols, centered on the page. Example: Scot-Noel-Spell-of-Flight.doc (or .docx,.rtf). Please, no PDF files. Your Story Tracking page now shows your first submission. The Story’s status is updated here. If it is under consideration, returned, or accepted, you’ll see it here. We also notify you via email of any final status on your story. As you submit more stories over time, you’ll see them all in your Dashboard. If you run into trouble, you’ll notice that your Profile also has a selection called Submit a Ticket. That’s how you can let us know if you have a question or concern. A real live staff member will get back to you. The best way to learn what any magazine wants is to read what they are publishing. Your free registration gives you access to a selection of our stories. Take advantage of it. For the fullest sense of what we are about, consider an Online Subscription. An annual online subscription is only $19.99, or you can pay monthly at $2.25, which is certainly worth it to give yourself the best chance of understanding us by reading us. Just login to your Portal and choose the Fire Tender subscription! Would you like to be on our Writers’ e-News list and be made aware of our reading periods, other reading periods we hear about, and in general hear about news of interest we come across? If so, send a request to be included on the mailing list to submissions@dreamforgemagazine.com. 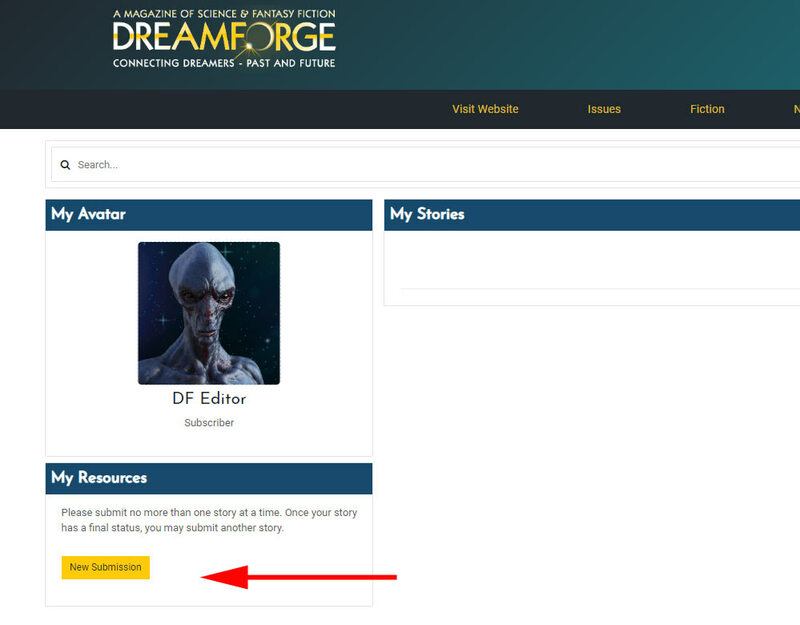 Remember, you can click any image on this page, or the following link, to visit our DreamForge Portal Login.